Reuters: Vattenfall is considering converting its German coal-fired power stations to use fuels including gas or biomass as utility companies in the country brace for a government deadline for phasing out coal altogether. The end of coal is the latest major challenge power firms face in Germany, whose energy transformation, or “Energiewende”, has already included a rushed exit from nuclear power and a costly expansion of solar and wind capacity. Vattenfall corporate.vattenfall.com, owned by the Swedish state, operates 2.9 gigawatts (GW) of coal-fired power stations in Germany, including the 1.7 GW Moorburg site that only opened three years ago and supplies 80 percent of Hamburg's electricity. The way German power station operators deal with their coal assets is crucial for investors, jittery ahead of a December announcement from a government-appointed commission about how coal plants will be phased out of Europe’s largest economy. “How long Moorburg will run significantly depends on what the coal commission decides,” Vattenfall board member Tuomo Hatakka told Reuters. 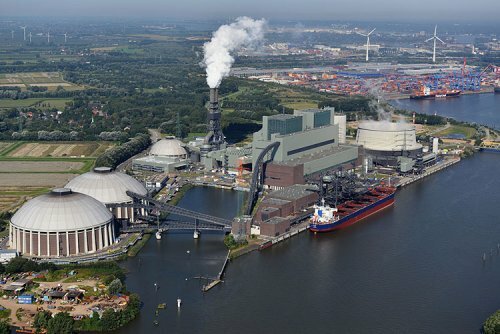 German rivals EnBW, RWE and Uniper, have also started to retrofit coal plants for biomass or gas, or are considering such steps to soften the hit to earnings a shutdown of the power stations would entail. An accelerated shutdown of Moorburg would be a major blow to Vattenfall, which spent 2.8 billion euros ($3.2 billion) on the plant. Converting coal-fired plants to fuels such as gas or biomass would also lead to marked drop in generating capacity. Hatakka also said Vattenfall was planning to shut its Reuter West and Moabit coal-fired stations no later than 2030 and partially replace them with industrial waste heat, waste burning, biomass, power-to-heat and gas technology. Shutting coal plants will be the third major shift for power companies in a decade. They scrambled to cope with a state-ordered expansion of renewable energy and then faced the sudden decision to stop nuclear power after Japan’s Fukushima disaster. As a result of the policy changes, German electricity consumers now stump up more than 20 billion euros a year to subsidise solar and wind power, while utilities had to write off billions of euros from their nuclear stations. Berlin later had to compensate them for the forced closures. "I don't believe that wind turbines and solar modules will be enough to generate power in the future," said Georg Oehm, chair of the administrative board of the 53 million euro Mellinckrodt www.mellinckrodt.com/en equity fund. In 2017, cheap nuclear power accounted for just 12 percent of Germany’s power production, down from 22 percent a decade ago. Meanwhile, the share of renewables in the energy mix more than doubled to a third last year. Germany aims to raise that to 65 percent by 2030 to help cut carbon dioxide emissions and achieve its climate commitments. Britain and Spain, in contrast, have taken a more measured and less costly approach to expanding renewable energy and kept nuclear plants on line to provide cheap energy, EU data shows. The use of coal to generate electricity in Germany is on the wane but it is still the most commonly used fuel. In 2017, coal and lignite, or brown coal, accounted for 37 percent of power production, down from 46 percent a decade ago. Biomass usually refers to energy generated by burning wood pellets, often made from compressed sawdust, or other organic matter. The 31-member coal commission will likely recommend an end-date for coal plants in the 2030s, several people close to the commission told Reuters. Two said co-chair Ronald Pofalla last month recommended a complete phase out between 2035 and 2038. The oldest and most polluting plants are expected to be shut down right away though operators may be allowed to compensate for a fall in capacity by producing more power at newer coal plants for a while. EnBW said switching to gas and biomass could work for its coal-fired plants, as did RWE, Germany’s leader with 14.7 GW of coal-powered production capacity. It said building new plants on phased-out coal sites would be an option. "Premises like that are in demand," RWE said, adding that it could also sell sites to investors - as it did in Britain last year by selling its oil-fired Littlebrook plant to real estate investment trust Tritax Big Box tritaxbigbox.co.uk. RWE, reeling from a court decision this month that effectively delayed brown coal mining in the Hambach Forest hambachforest.org, singled out its former plants at Voerde and Bochum as being potentially attractive for investors. Uniper sees similar potential for converting its 828 mega-watt (MW) coal-fired Scholven plant in the industrial heartland of North Rhine-Westphalia. It is spending at least 100 million euros to retrofit the plant with gas turbines by 2022. As part of the plan, Uniper has teamed up with German chemicals company Evonik to build a 15 km (10 mile) gas pipeline to connect Scholven to the network of Open Grid Europe. The retrofit, however, will drastically cut Scholven’s capacity to about 110 MW, because it is harder to turn a profit from gas which is imported mainly from Russia and is more expensive than coal. “It’s open how many employees will still be working here in the future,” said the plant’s manager Lars Wiese, adding that Scholven’s current workforce of about 200 could more than halve. To make sure its Scholven investment will pay off, Uniper has agreed a long-term partnership extension with an industrial enterprise nearby. It declined to name the partner. Companies with operations close to Scholven include British oil company BP and chemicals firm Saudi Basic Industries Corp (SABIC). Wiese said Scholven could also offer services such as delivering compressed air, water treatment, waste heat utilization and plant maintenance. LEAG www.leag.de/en/company, Germany's second-biggest operator of coal-fired power stations with about 8.1 GW of capacity, declined to comment on its plans. LEAG is owned by Czech energy company EPH www.epholding.cz/en and private equity firm PPF Investments www.ppfinvestments.com. Investors such as Germany's Union Investment union-investment.com/home.html and Norway's $1 trillion sovereign wealth fund www.nbim.no/en/the-fund are watching for cuts in exposure to polluting assets closely - as they are not allowed to invest in companies that derive a substantial share of sales from coal. “We have to regularly review our stance also with regard to coal,” said Thomas Deser, senior portfolio manager at Union Investment, which holds shares in RWE and Uniper.